Report on our work in Haarlem. The situation has deeply influence our whole work lately. 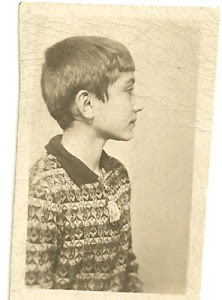 The new laws for strangers seemed to make our educational work more difficult, as most of the children staying with us have no valid passports. But the fact that the police in Haarlem is on very friendly terms with us and appreciates our work has helped us very much, the information they sent on to the governmental officials were very favourable and we have thus no difficulties. The fact, that we are not achieving Dutch education, that we are a German school with an international outlook convinced the Government that the children staying with us would not remain in Holland later on. Only on this condition we shall be able to take other children from Germany and the former Austria when places are vacant. The question of the Austrian children was also a concern of course. And as two of the older children of ours are about to join their parents shortly we applied for four Austrian children. But as others had also tried to get in Austrian children without satisfying the demands the government makes: that is without being able to give a satisfying guarantee as to the children's future, the whole question has been adjourned and is to be decided principally. But as we had several very urgent cases Manfred succeeded in getting the special permit for two Austrian children to come immediately who will be with us in a few days if nothing interferes. Only the information of the police here and the impression the Attorney-General got with whom Manfred had several talks made this permit possible. These are the first Austrian children to be allowed to come in. But beside this educational work it is the work with German refugees that took most of our interest and strength lately. The existing Committees coped with this problem but have not altogether always worked practically. They often failed to see the personal problem that the refugees represent. Just this personal work proved to fall to our lot, the cases that came to us increased with the time. Manfred was several times in the Hague discussing the problem the refugees represent with several higher officials. He had a long talk with the representatives of the Evian-Conference who were very interested in his views and asked him to send in a report on this question. We succeeded in getting permission to stay prolonged in some cases. We succeeded in getting some families over to South America. Five other families are trying to get their visas to U.S.A.
Two Men we helped to come out of the concentration camp and succeeded to get warrants of 200 dollars for the crossing to Columba in each case. We got Gerhard Friedrich out of the Danish prison through our wires to the prison. French Friends and Swiss Friends had written to us on his behalf and he had wired to us in his calamity. We helped a Berlin Young Friend over the frontiers these last days. He does not feel able to enlist. His father lives here and as the boy is only 18 years old his father wanted him to leave Germany in this situation. But the boy has no passport being an half-Aryan, the question was thus not quite simple but had to be done in a smoother way than Gerh. Friedrich did. In this last case some Berlin Friend asked us to help. We want to stress the point that in nearly all cases personal talks which touched more than the practical calamities developed. The compass which this activity has reached may be best seen is some figures: From the second half of August til now we had 160 callers who all wanted advise or help or came to speak on more spiritual questions. And more than a hundred letters came in and had to be answered. We actually have become a Friends Centre and often have to do some bits of work that is in a way similar to that which Friends are doing in their International Centres. The fact that we are the only German Friends here and the only not Dutch Friends living here gives us some possibilities of working also with officials of the state which Dutch Friends have not just in this time when here too a more conservative and military spirit begins to rule. 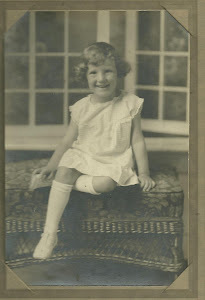 Such more discrete cases connected with Concentration camps and COs as well as so many people in somewhat difficult family situations seem to feel more confidence in us as German Friends than in persons of another people. The Dutch in general have not yet undergone so much suffering as we and Woolman is right in saying: only those who "have the heart of the strangers" can feel with the miserable. Considering this situation that has actually arisen and our work as we thought it right to ask you, if you feel inclined to acknowledge this state of affairs and our work done in the spirit of and for the Society for which you could share the responsibility. It would of course be of considerable help for some of our work if we could feel entitled to speak not only as personal Friends but for the ends of the Society feeling to be a "Centre of Good will" that you support with your sympathy and spiritual help. The expenses for our small "Centre" would not be high, we should only like to have some cash for the increased expenses for postage that forced us to cut down our expenses for our living quite considerably lately. A sum of 5 Dollars from the American Friends Committee and some small contribution from Friends Service Counsel for this special work would help us financially and give us at the same time the feeling that Friends are willing to take part in our work. We certainly would not ask you for that if we did not feel sure that our being here and the fact that our whole family shares in this work is of some importance. Often the feeling of opposition to the Germans as such is corrected, we were happy to experience in these last days of political tension the friendship, that has arisen between us and Jewish as well as Non Jewish persons. This is the first letter that we share on this blog, and it seems fitting that it is written by German Quakers who are living in a Holland suburb of Amsterdam, to English-speaking Friends in Britain and America. This is typical of my story as we move forward from the beginnings here. The amazing part of this story (outside the story itself) is that I have this incredible collection of letters to help me tell it. Never in my wildest dreams did I ever think we would find so many documents that would tell us details that even Opa didn't know about his story. 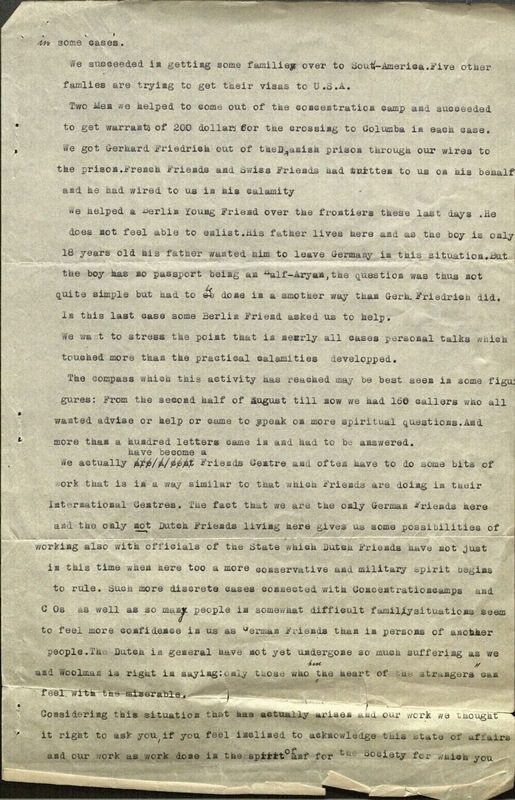 This letter was actually found in the case file for the Pollatz’s from the American Friends Service Committee (AFSC) archives- that is now in the Holocaust museum. That sentence was a lot of information. Let me unpack it. The AFSC has a vast archive selection, primarily because these folks have made it their mission from the beginning of their group’s formation to help people in need. Effectively helping people in need requires a lot of communication and diligent paperwork- creating these lovely case files. A portion of the AFSC archives were donated to the Holocaust Museum located in Washington, DC, because they contain information pertinent to refugees from Hitler’s regime in Germany. The Holocaust Museum is an excellent place to donate your archives because they effectively curate and share the files with the public. In fact, they shared these AFSC case files with me- connecting me to some of the most compelling and informative documents I have found in my research. I have my grandfather’s case file, but as many research projects go- the deeper you dig, the more places you find to dig. 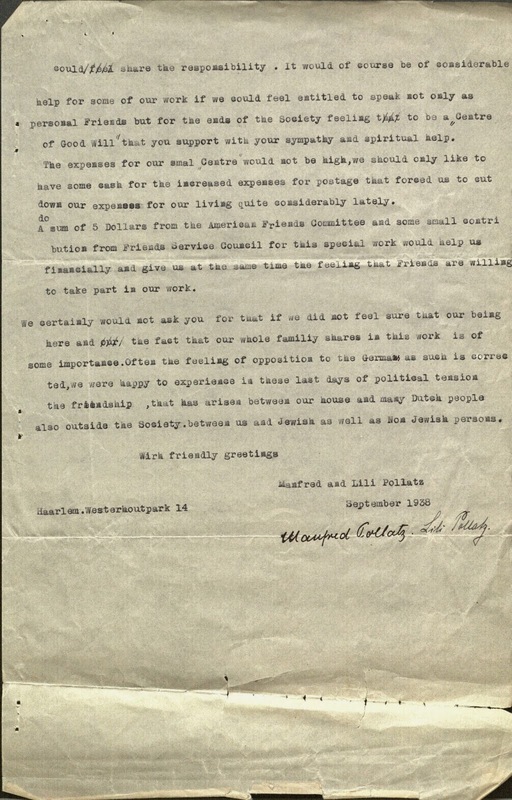 This letter was actually in the case file documenting the journey of Manfred and Lilli Pollatz. We learned about this couple through Opa's AFSC file, and when we dug into their case file, we found this gem of a letter that sort of starts Opa's story. 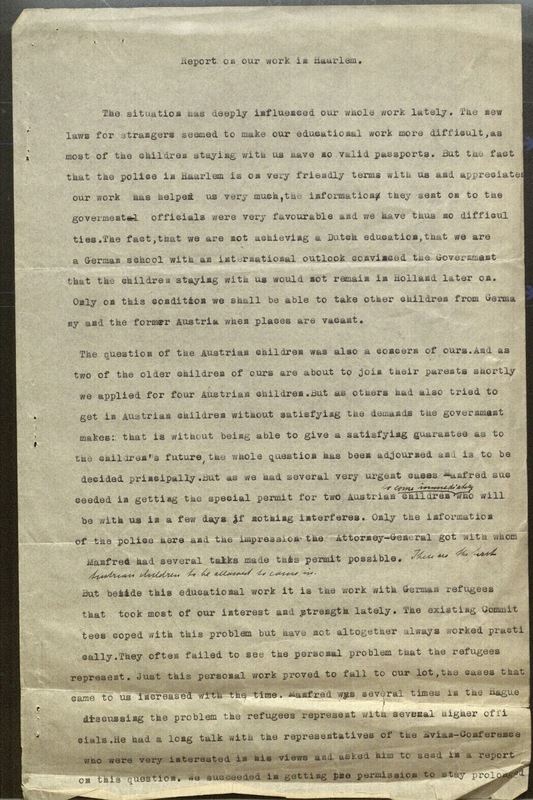 This letter not only gives us a glimpse into the beginning of what was a grass-roots movement by the Pollatz’s to help refugees, but it even tells us specifically about my Opa. That Berlin Young Friend that is mentioned: that’s my Opa. And by the sound of this letter- the Pollatz’s had an instrumental part Opa’s being smuggled out of Germany. Oh I wish I had those details from the other side! Was it the Pollatz’s that orchestrated the whole thing? Did they “know” people? If nothing else, I think this letter is at least evidence that they had a hand in my Opa’s first escape: Germany into Holland. 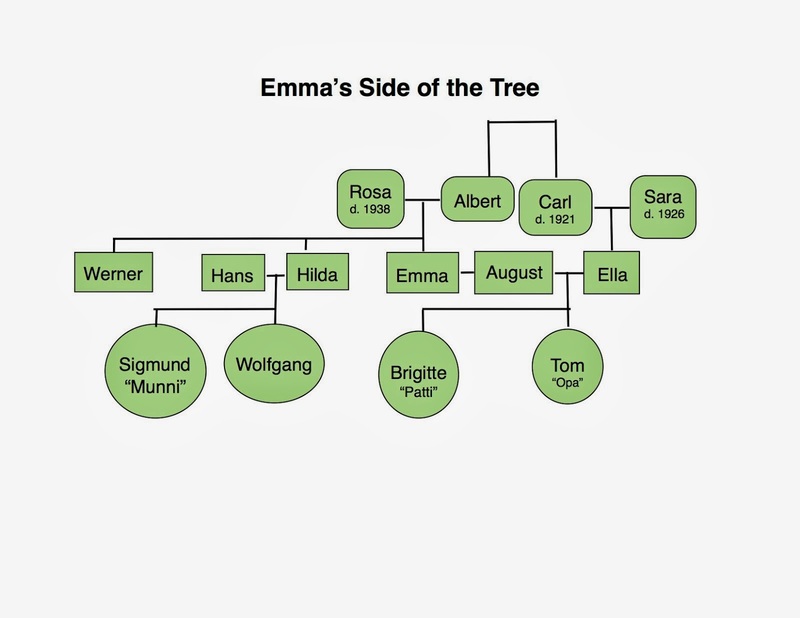 I wonder how August (Opa's father) knew to contact them? I’m guessing he asked the Berlin Friends, or that the Friends contacted August with the Pollatz’s in mind. 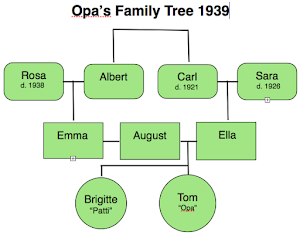 It’s just mind boggling to me that a story I grew up hearing about: Opa being smuggled out of Holland by some unnamed group of people- these Pollatz’s are a piece of that puzzle. And I found that piece in an old letter in an archive that hadn’t seen the light of day until just a few years ago when the Holocaust Museum started looking through them. I never thought I would say this, but: research is fun. The last thought I have about this amazing letter is the feeling that comes with it. The Pollatz’s know that something is happening here. They’ve received numerous calls, letters, and visits about this movement- exodus out of Germany and her captured lands. The Pollatz’s have unwittingly become a sort of refugee center themselves by being available and surprisingly good at addressing the concerns brought to them. This is basically a call to the Quaker community to support them as the “Friends Center” that they are becoming. Just $5 for postage and some extra support- that’s all they need. Amazing. It shows you what amazing things can happen if we just allow ourselves to be available when someone asks for help, and ask for help ourselves when we find our work to have increasing meaning in the community. The Pollatz’s are officially added to my list of people to thank.